Brazilian wonderkid Vinicius Junior was bitten while playing for Real Madrid Castilla by Atletico Madrid B's captain Alberto Rodriguez. Real Madrid agreed a £38m deal with Brazilian side Flamengo to sign Vinicius in 2017 with an arrangement for the move to be finalised in July 2018 when he turned 18. Following his arrival in the Spanish capital, Vinicius was part of Julen Lopetegui's squad for Real Madrid's pre-season tour of the USA, however he has failed to break into the senior team thus far. In the meantime, the Brazilian forward has been playing for Real's reserve team in the Spanish third division and he impressed in Sunday's mini 'El Derbi' against Atletico B - scoring both of his side's goals as the game ended 2-2. 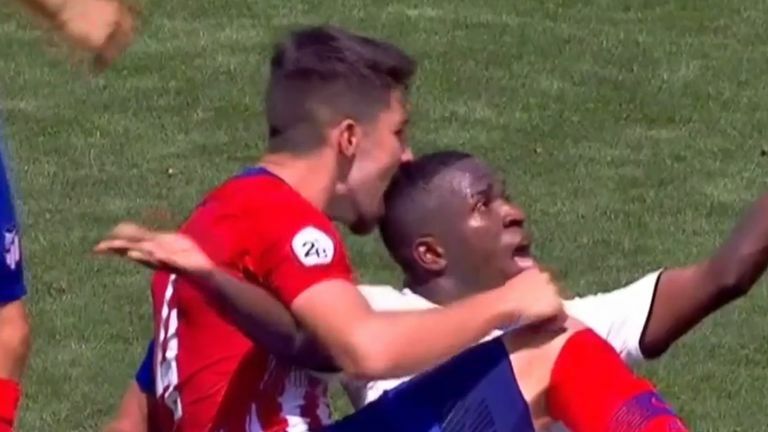 However, the flash-point of the game was a tussle involving Vinicius and Atleti's captain Rodriguez, or 'Tachi', as the defender appeared to bite the top of the Brazilian's head. The incident resulted in both sets of players coming together in the middle of the pitch. The referee awarded both players with a caution for their behaviour. Click on the video to watch the incident!